I am a big believer in family-friendly design. I think it's important for a space to feel comfortable for everyone in the house and to also be a reflection of your lifestyle. However, that being said, just because you have kids doesn't mean that your house has to be a reflection of the Disney channel (not that there is anything wrong with that if you choose it) so to speak. When I became a mom it was important for me to still have a comfortable home that I felt really relaxed in and was still a reflection of the things I love. Every family has their own way of doing things that work for them. I have always believed in "not" removing everything out of the reach of your children (well obviously you want to move things that are dangerous or that could hurt them) but in terms of basic design accents, I think its important for kids, especially toddlers to learn right from the start that just because something is within their reach, doesn't mean it's theirs. I get asked how I can have design items on my coffee table and on low shelves with a toddler and the truth is, he is so used to things being around that he really doesn't mess with them or seem overly interested in them at this point. I think it's because there has always just been "stuff" out so it's nothing new to him. Our main family room is where we spend most of our time and really functions as a play area for the boys but also at the end of the day once the kids are in bed, it needs to function as a relaxing adult space. 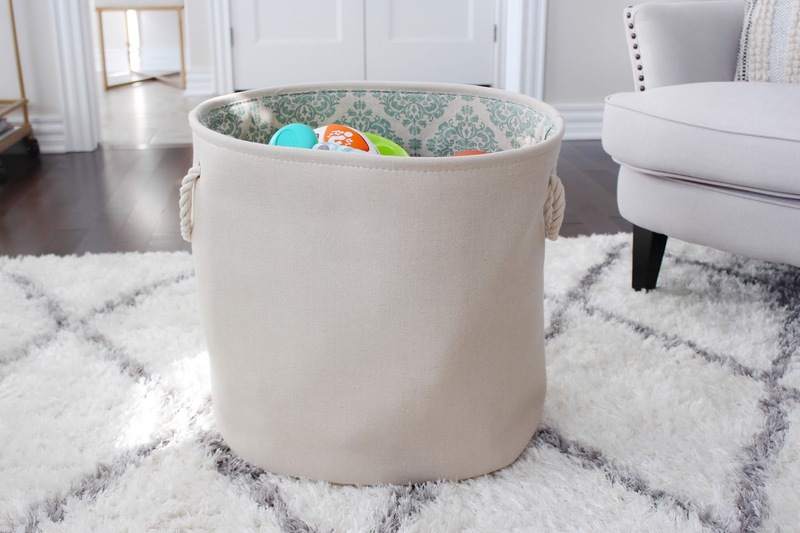 I love to keep some of these simple baskets from Homesense (they come in tons of patterns and sizes) in our family room with some of their favourite play items of the moment in them. That way it's super accessible for them but also an easy clean up at the end of the day. The baskets look pretty and can easily be out visible in the space but keep everything looking organized. 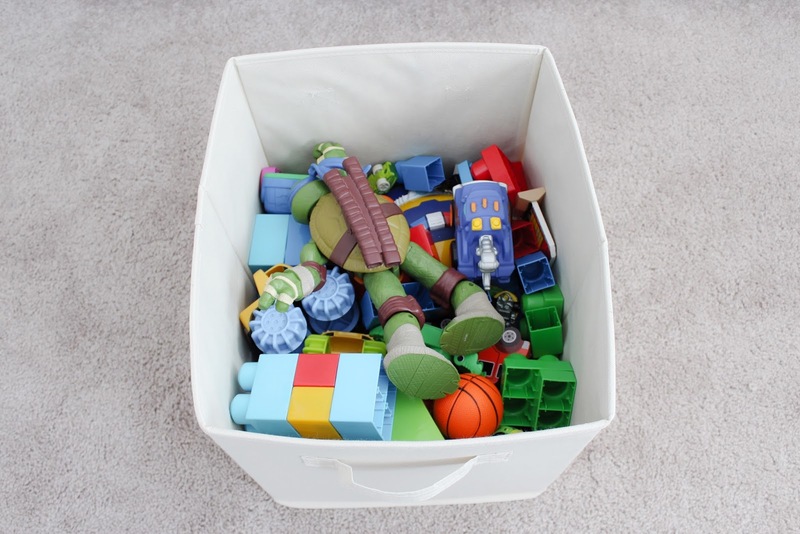 I also have these bins in a toy organizer in my sons room. Every morning we bring 1 (or 2 or 3) down to the family room with extra toys he is wanting to play with. Then at the end of the day I just bring it back up into his room into the organizer and its even less clutter downstairs. 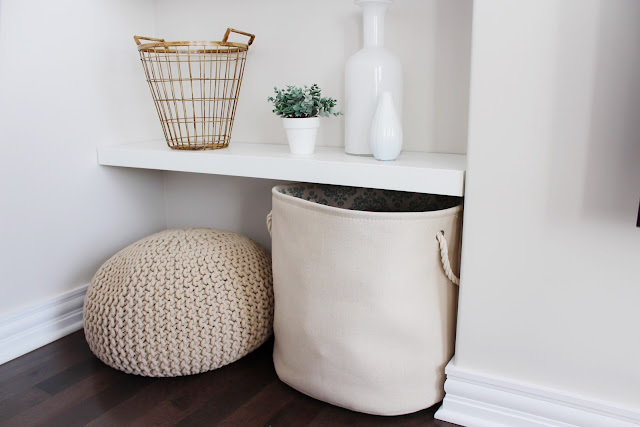 This really helps our family room stay a multifunctional space. I am sure I speak for most parents out their when I say that at the end of the day I need a nice clean relaxing place to unwind in and having concealed toy storage really is key. 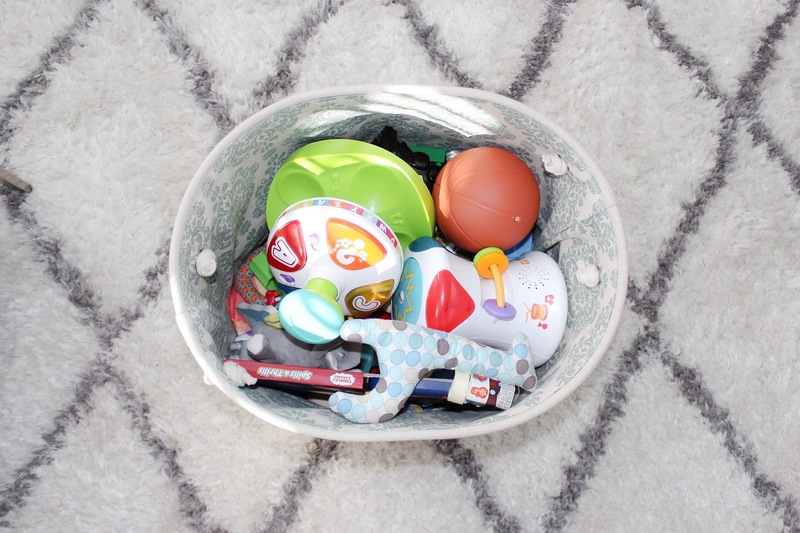 Life with two kids can be quite chaotic at times and I find a bright, airy and organized family space really helps keep everyone more relaxed and is generally calming. Hopefully these simple organizational tips will help some of you guys out, and I hope you all have a great day!